From March 20th, Reeps One be taking over LondonNewcastle in Shoreditch for a week, to exhibit a vast array of his work; from paintings, writing, lectures, photographic collaborations and a live performance. Increasingly his other outlets of expression are catching up with his music, so he will be showcasing how his thirst for expressing ideas can manifest in one amazing space. 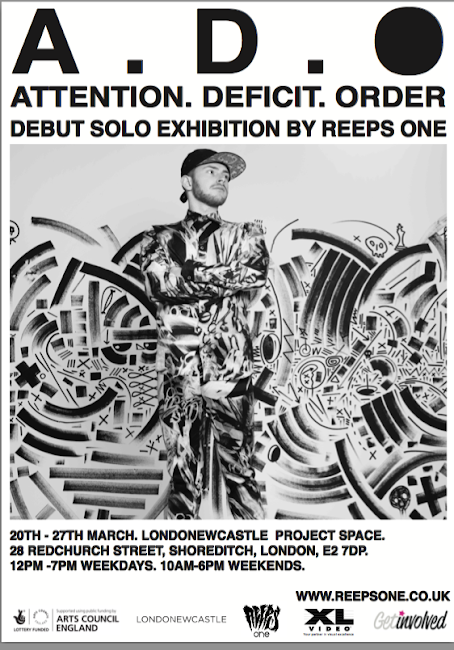 Reeps One is particularly excited to display his new work with photographer Ben Hopper and the futuristic imagery from his ‘Organic Electronic’ project with Zach Walker and Linden Jay. The aim will be to shock and surprise, if you are a fan of any aspect of the Reeps One creative intention, don’t miss out on this event. "Reeps One AKA Harry Yeff was labelled with A.D.D at a young age. Named as a disorder, the attributes of this condition have been the very reason his creations have gathered global attention, with fans in the 10’s of thousands and online views in the multi-millions. Reeps One's exhibition will bridge the gap between concept, music, performance and art, designed to enter you into his dark and exciting world world, where no sensory stimulation is enough and more fun and surprise is always an option"
Opening times: 12pm - 7pm on weekdays, 10am - 6pm at the weekend. Exact times & schedule of events TBC. MARCH 22nd // Day of games 1pm - 6pm – Reeps One Performance in COMPLETE DARKNESS. Come and do something you have never before. Body painting, pitch black, chess and test your minds to win original art. Reeps will flex his vocal muscles perform the Reeps One Show. MARCH 26th //Open. Your. Mind. OYM talks – Curated by Reeps One, we will open our doors to talented minds sharing their ideas and the legendary HOWARD MARKS will headline the evening. Full details can be found via the Facebook event page here.